Figure 1. A: Scheme of Frasnian-Famennian (F-F) global event and two-step Kellwasser crisis (based on Gereke and Schindler, 2012), and related volcanic events after Winter (2015, his figure 2). 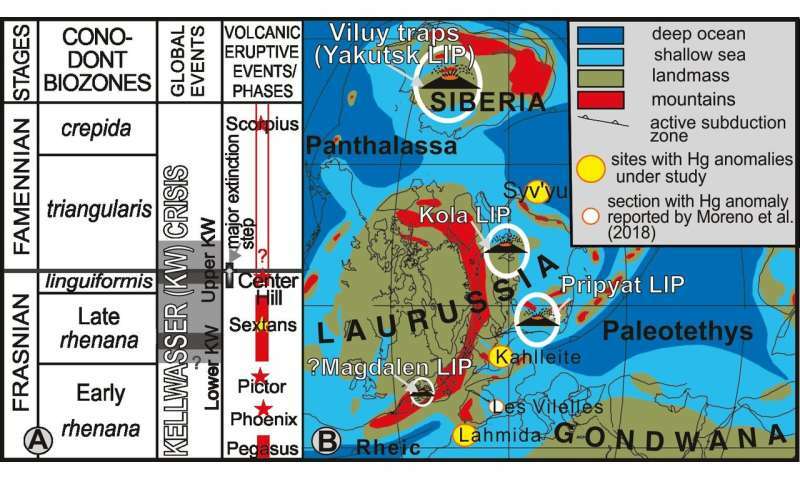 B: Locations of F-F sites studied for Hg abundances, compared to inferred proximity to coeval large igneous provinces (LIPs; after Kravchinsky, 2012; Ernst, 2014; Late Devonian paleogeography after Golonka et al., 1994). Credit: Racki et al. The late Devonian extinction, about 370 million years ago, is one of the 'Big Five.' It killed up to 80 percent of species, obliterating the lavish Devonian coral reef ecosystem. The final pulse in this multi-step crisis, called the Frasnian-Famennian event, was its most devastating. But what, exactly, did the killing? Now, geologists have discovered a likely culprit: major volcanism, as revealed by a widespread pulse of mercury. The study was led by geologist Grzegorz Racki of the University of Silesia, Sosnoweic, Poland. "Up until now the main debate on this mass extinction has been what the main direct cause was," explains Racki. "We provide the first clear evidence for volcanism." The study was published online ahead of print in Geology on 26 April, 2018. The team analyzed rocks from Morocco, Germany, and northern Russia, all dating from the same short geologic interval 372 million years ago, just before the Frasnian-Famennian boundary. In addition to being spread across two continents, the rocks varied from black shale, grey shale, to limestone, and ranged from a few centimeters to a few meters thick. Yet they all shared one particularly striking characteristic: a sharp mercury peak hundreds of times higher than background. In other mass extinctions, elevated mercury has been closely linked to big-time volcanic episodes. In fact, points out Racki, mercury has become to Earth-based catastrophes what iridium is to extraterrestrial-based ones. "Mercury as a geochemical fingerprint of volcanism appears decisive in the new stage of mass extinction studies," he says. "Now we can say that all of the 'Big Five' mass extinctions coincide with major volcanic events," adds co-author Paul Wignall, with the University of Leeds in England. "Until our discovery, this (late Devonian extinction) was the major exception." So far, the actual smoking gun—a large region of age-appropriate volcanic rocks—has yet to be unearthed. Racki suggests that the leading candidate may be in Russia, although telltale volcanic rocks have apparently either been eroded away or deeply buried. That absence actually provides another take-away from the study, says Wignall. "It's possible to discover evidence for giant volcanic episodes, using trace metals in sediments, even when the lavas themselves may have long vanished," he says. ^^^^^^Absolutely nothing to do with this article. That is the second time you've done this. Knock it off. @macurinetherapy always has a crazy idea to explain some minor thing or other. Like, for example, urine therapy. I mean, just sayin'.